Is Dr Phil doing a show on Lyme Disease? | What is Lyme Disease? Is Dr Phil doing a show on Lyme Disease? Rumor has it that yes, he has already taped one. 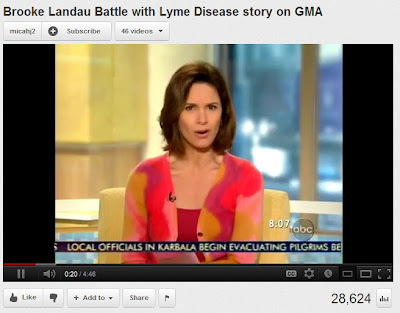 Along with the spotlight Dr Phil will be putting on Lyme Disease, Brooke Landau will also be interviewed in the show! LLMD, Dr. Chitra Bhakta just finished taping THE DR. PHIL SHOW and she said it went very well. Brooke Landau, Emmy Award Winning Weathercaster with the CW Network in San Diego will appear on the Dr. Phil Show on Friday, April 13th. Brooke shares her 17 battle with Lyme Disease. One which some doctors have called, the worst documented case in the country. Brooke went to bed fine one day, and woke up paralyzed. She overcame that battle and today she continues to fight and survive. Brooke’s survival story has been featured on the Today Show, Good Morning America, Fox News, ABC, Discovery Health, Mystery ER, CW Network…and now the Dr. Phil Show. Brooke says she continues to speak out for those you can’t. Check out Brooke’s News interview from before.